An early build of Dreams was first shown back at PlayStation Meeting 2013, which was the event announcing the PS4. In a tech demo, the studio’s developers crafted a band in-game to play music together. A teaser for the actual game then followed in the summer of 2014, with Sony not officially announcing Dreams until E3 2015. A beta was due out in 2016, but it got delayed twice. The beta didn’t finally get underway until late last year, with the release of the game itself getting pushed into 2019. In short, it’s been a while. During that time, developers have offered up interviews, previews, and even hands-on demos of Dreams, and while the buzz has been positive, it’s also been hard to glean what the game is actually like. The complex and confusing nature of this game that’s about making games made it hard for the people who had tried the game to clearly convey why they liked it. Keza MacDonald said as much in her own preview of the game last month for Kotaku. Now that the beta NDAs have run their course, the ongoing trickle of videos and screenshots of player creations has finally helped illustrate how this game works. Even prior to the NDA sunsetting, some interesting creations had been leaking out, including a remake of Kojima Productions’ psychological horror game, P.T. Lots of people have remade P.T. since Konami took it off digital store shelves, but no one had made it within another PS4 game with anything close to that level of fidelity. Dreams trailers often highlight the whimsical, surreal things that can be created in it, but the fidelity of the P.T. prototype also shows just how robust the game can apparently be. One of the other stunning recreations that made the rounds recently was a short walk through the bridge of a spaceship inspired by Dead Space. The similarities are impressive, but what’s most striking about the demo is how the light from a nearby sun shines in through the skylights and main viewer. One of the most appealing aspects of Dreams is that you don’t have to learn every one of the game’s design tools to create and share stuff. People can work on just making music or designing a particular character. Other players can then take these individual components and incorporate them into something more complex. 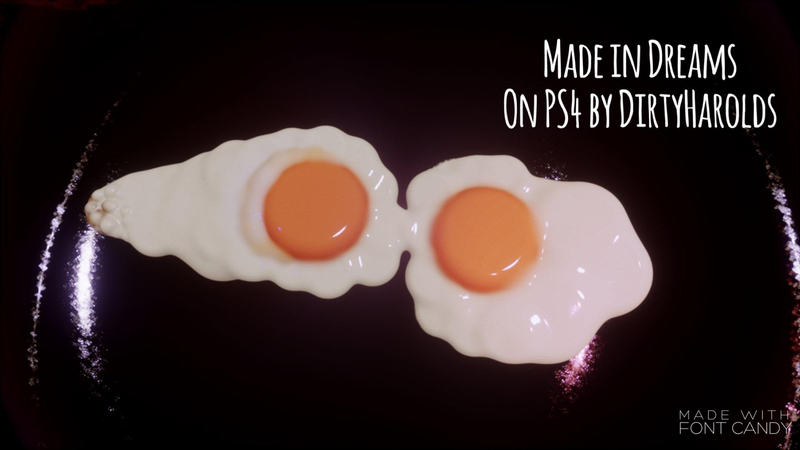 One of my favourite creations so far is this person’s fried eggs. They look glorious, on par with foods you can prepare in something like Final Fantasy XV, except in Dreams they can be shared, augmented, and repurposed over and over again for whatever wild idea pops into someone else’s head. Some of the other cool stuff people have been making recently in the Dreams beta includes a super-detailed and brooding recreation of a metro station that was designed for a shooter someone else had made in the game. There’s also this: a platforming level of a pea trying to make its way around a kitchen to get into a pot of water to boil itself. People have already started testing out games specifically designed for speedrunning. And someone recreated the icy surface of Jupiter’s Europa moon, and I want to go to there. Dreams still doesn’t have a release date, but for a more in-depth look at some of the games people have already started making in it, you can check out this recent video by Media Molecule recapping some of the creations submitted for the recent Dreams Global Game Jam.